'Blink' (Lynda Miller, R. 1995). Seedling #191CA. MDB, height 5.5" (14 cm). Late midseason bloom. Standards creamy yellow; style arms cream, veined light blue; Dalls russet brown edged medium yellow; beards pale blue, tipped orange in throat. Seedling #487: ('Bee Early' x seedling #384, unknown) X seedling #1087: ('Copper Chief' x unknown). Miller's manor 1996. Honorable Mention 1998. From AIS Bulletin #301 April 1996 Introducing BLINK (Miller) MDB, 5.5", ML. 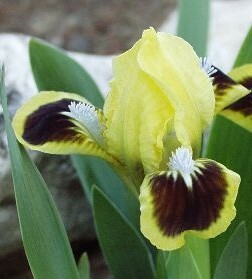 Pert cream yellow standards sit on top of russet brown flaring falls edged medium yellow. Pale blue beards stand out on the russet brown spots. Style arms are cream with light blue veins. 191CA: (Bee Early X 384) X (Copper Chief X Unknown). 10.00. Miller's Manor Gardens.